Ok, if you don’t know it already, I have a daughter. She is a sassy, diva little almost 3-year-old that keeps her dad, her brothers and myself on our toes. She is a dirt loving, Barbie playing, tutu wearing princess. I do not lie. I mean how could you not love dirt when you have 3 brothers to keep up with!! 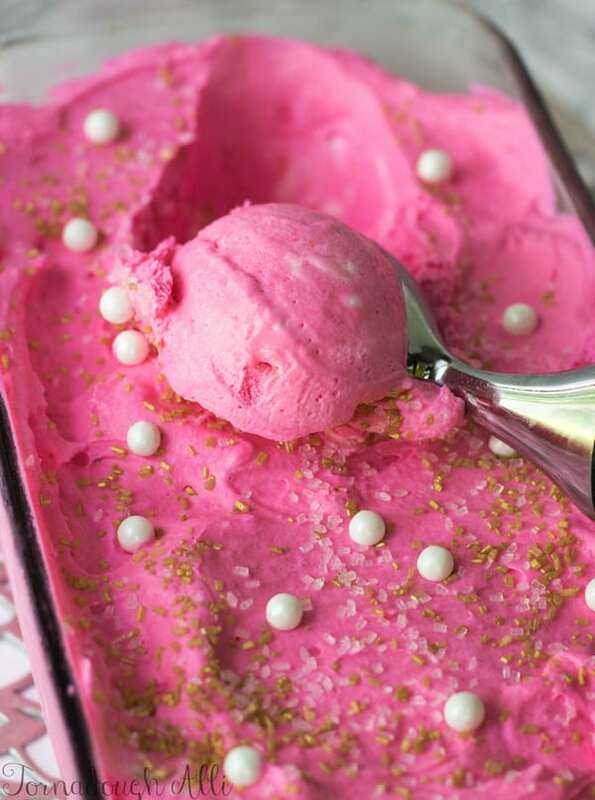 One of our favorite things to make together has been ice cream this Summer! She adores how easy it is, and loves watching me come up with some ideas. 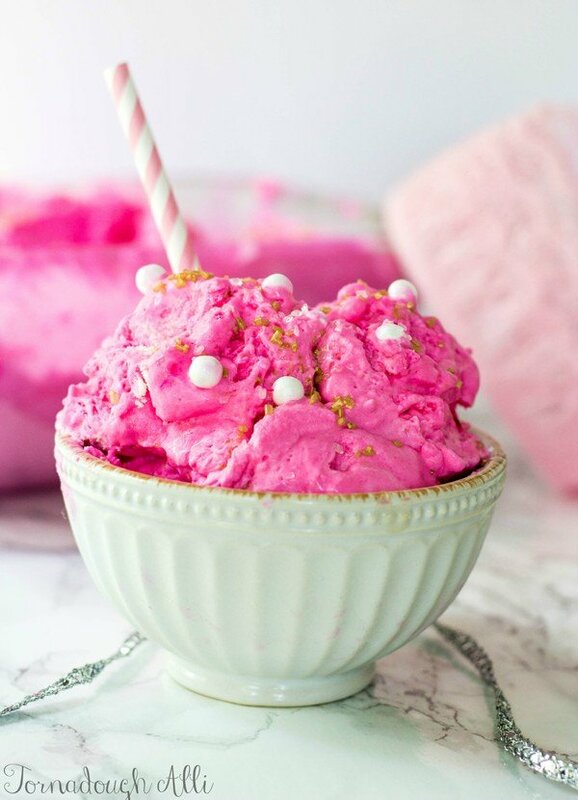 So this Princess Pinky Ice Cream is something that was more to celebrate her and her bright personality that she has! 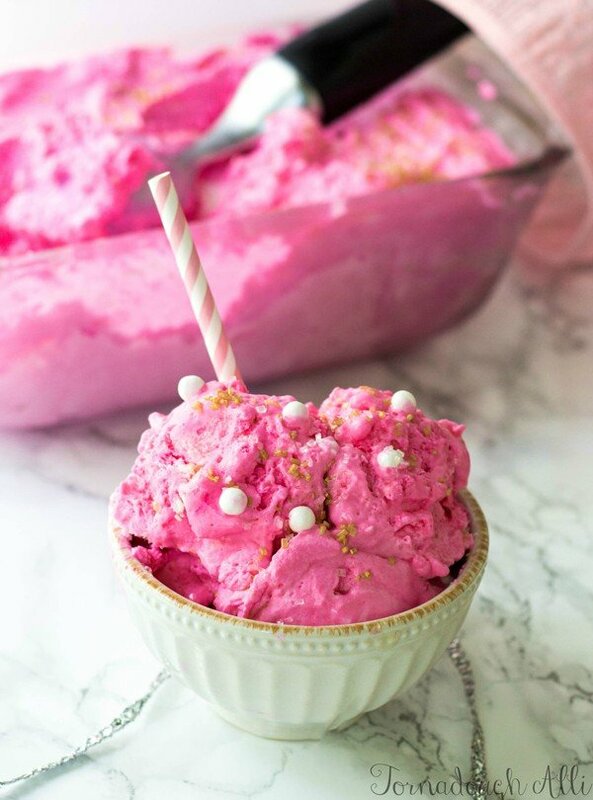 This would be amazing to have at birthday parties, baby showers, wedding showers, you name it, this ice cream is a perfect match for it! Besides, it’s cake flavored and who doesn’t already love that!! I know that I already adore everything that is cake, so this ice cream was a no brainer when it came time decide on a flavoring. 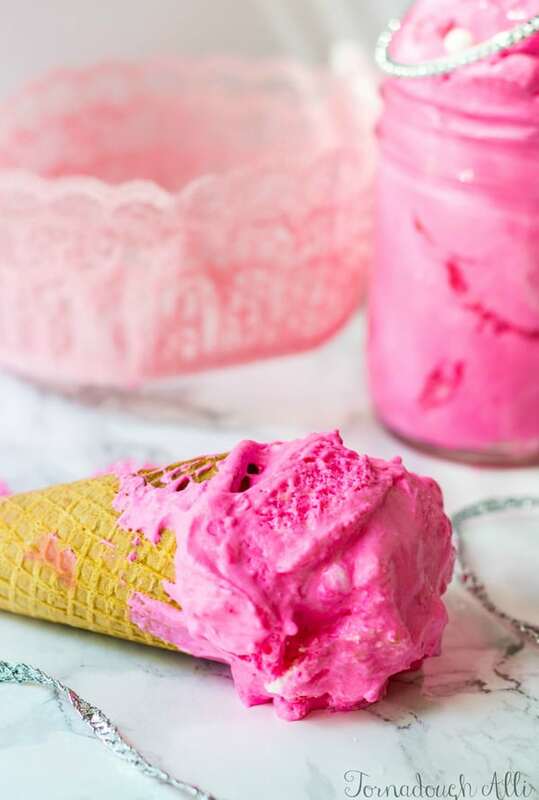 If you haven’t made homemade ice cream before because you were scared or simply didn’t have an ice cream maker then you are in luck my friends!! This stuff is no churn. The hardest thing about this is waiting for it to actually solidify before you can eat it. Seriously, it’s always the hardest part because this is some stuff that I just want to dig into as soon as I can. 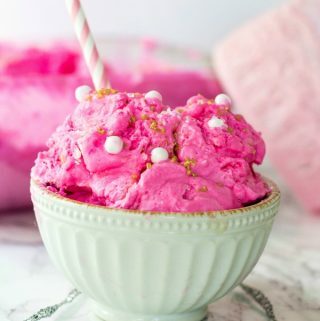 What is Summer though without a little bit of ice cream? If you are looking for some other great flavors you can check out my Monster Cookie Ice Cream or my Apple Crisp Ice Cream, both great options and fun things to do with the kids. I know mine keep asking when I’m going to make some more! It’s hard to keep this stuff on hand when your kids literally devour it in minutes….and I’m not joking either. 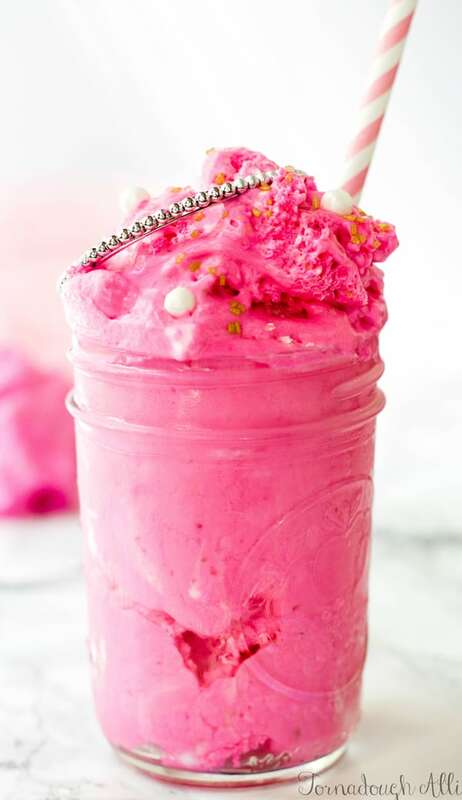 What are some of your favorite ice cream flavors?! I’d love to get some more recipe inspiration! 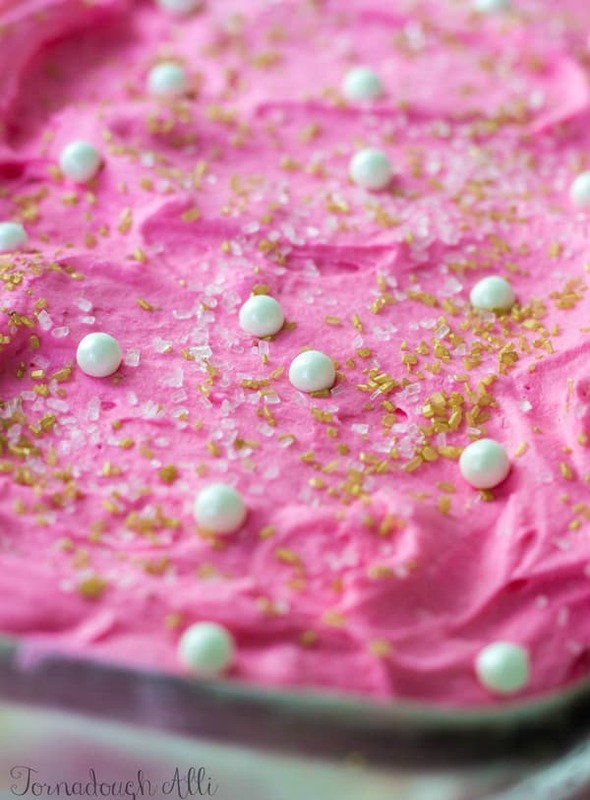 In bowl mix together your sweetened condensed milk, cake mix and enough food coloring to get the bright pink you desire. In a larger bowl add your heavy whipping cream and mix on high for about 5 minutes or until stiff peaks form. Fold in your sweetened condensed milk mixture until combined. Stir in your candies and glitter sugar. Add ice cream into a 9"x5" bread loaf pan and cover with foil, freeze for about 4-6 hours until hardened. That color is amazing and this is perfect for a princess of any age!!! Love it!! Oh for sure. We are all a princess at heart.